Don't get caught with your voltage down! Protect yourself from low voltage damage by boosting the park voltage to your RV! 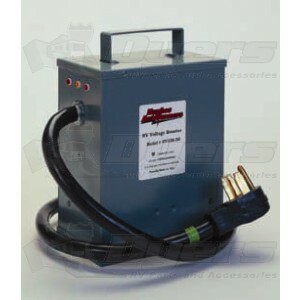 Autoformer provides protection from low voltage damage by boosting the park voltage to your RV! "Sense" circuit automatically turns the 10% boost on when the park power is less than 116 volts and turns it off when the park power reaches 118 volts. Built in grounding continuity test offers protection against damage from open ground, open neutral or reverse polarity - if the light isn't on, do not use the power source. Sorry, I rated 3 stars in all categories as I never used the autoformer once. After preparing to set it up once, I decided to stay only in RV parks with good power. Most 50AMP posts are not that old and provide good volts/amps. I still will use a surge protector. By the time you haul out the monster Autorormer, connect it, secure it with connector hasps and bicycle cable to the post (you have to secure it. it's way too pricy not to. And the places you may need it may be the places you really need it secured? ), you've spent 15 to 20 minutes on that project. And your back is in jeopardy. For the person who plans to stay in an RV park for months, this might be ok. Also it is such a heavy unit, it must add 25-30 lbs to your weight. And we all try to minimize our RV weights.